Google workers launched an organized campaign on Tuesday to persuade their employer and the tech industry as a whole to get rid of policies that they claim keep discrimination complaints behind closed doors. 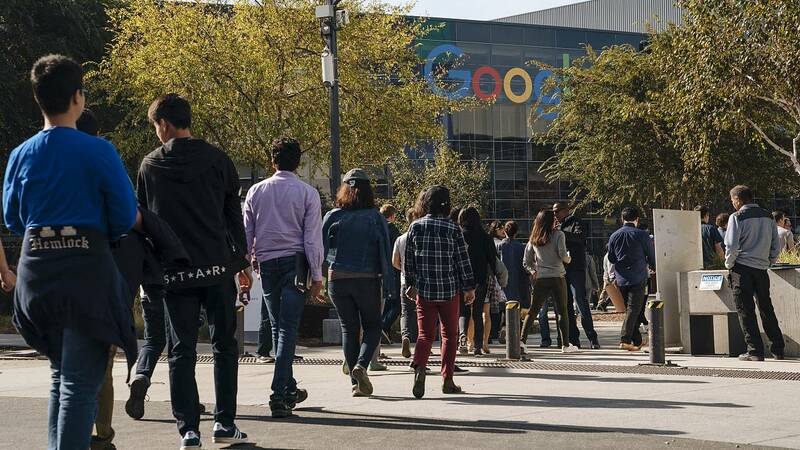 A group called Googlers for Ending Forced Arbitration posted stories on Instagram and Twitter about the impact of arbitration policies, which appear in employee offer letters and contracts and is known as mandatory arbitration. Mandatory arbitration generally requires workers to resolve discrimination claims through a private arbiter, often a retired judge or other lawyer, rather than through the courts — a process that the tech workers say means fewer rights for them. In arbitration, for example, tech workers say there is no way for them to obtain possibly damaging company documents. "This practice affects at least 60 million workers in the US alone," the group said in a post on blogging platform Medium. "Ending forced arbitration is the gateway change needed to transparently address inequity in the workplace." Tech companies have for years enjoyed positive reputations and sat atop rankings of the best places to work, but more recently Silicon Valley workers have grown vocal about what they see as systemic problems related to harassment, inequality or government contracts. Thousands of Google employees participated in a mass walkout in November to protest the company's handling of senior executives accused of sexual misconduct. After the walkout, tech companies including Google, Facebook, Airbnb and eBay in November ended mandatory arbitration for claims of sexual harassment, but they left it intact for other forms of alleged worker discrimination. Loretta Lee, a former Google software engineer, said in a video on Instagram that the November policy change did little to affect her claim of harassment. She said in a lawsuit filed last year that the company ignored her complaints about daily instances of harassment, such as employees spiking a drink of hers with alcohol and soliciting her for sexual activity. Lee's lawsuit seeks to get around a mandatory-arbitration requirement that was included in her employment agreement, which she said she didn't fully understand when she signed. "When you're in your 20s and get an offer from Google, you tend to sign it without reading all the pages of fine print," she said on Instagram. Google on Tuesday declined to comment on Lee's case but said in an email to NBC News that it was applying its November policy change retroactively to sexual harassment claims. In November, Google was still requiring Lee to use the arbitration process for some of her claims, Wired magazine reported. The search engine company was also still sending out offer letters to potential hires with its old arbitration policy, Googlers for Ending Forced Arbitration said on Medium on Monday. Google told NBC News on Tuesday that it has modified its offer letters for new hires to reflect the change. It was not immediately clear how many company employees were involved in Googlers for Ending Forced Arbitration. The group said in a response to an email that it wasn't sharing numbers for the safety of those involved. On Twitter, the group on Tuesday posted the results of a survey of employees at more than 30 tech companies. The survey, it said, showed that none of the tech companies fully met their three demands to make arbitration optional, allow for class action lawsuits and allow employees to talk freely about their cases. A Bay Area congresswoman, Rep. Jackie Speier, D-Calif., threw her support behind the workers and tied the arbitration issue to the broader movement to end sexual harassment. "In the era of#MeToo &#TimesUp it's clear that it's time to#EndForcedArbitration," she wrote on Twitter.